The E-Commerce giant Amazon is a customer-centric company offering many services. It offers a premium members service named as Amazon Prime. Amazon Prime users can take advantage of deals to buy products with super fast delivery. Apart from this, Prime users can have access to Amazon Prime Video. It is owned by Amazon that offers Prime Video Subscription. In some countries (UK, US, Germany, and Austria), users can opt for Video only subscription instead of full Prime subscription. With Amazon Video, you can purchase TV shows and films. You can either stream or download the videos from your mobile phone. 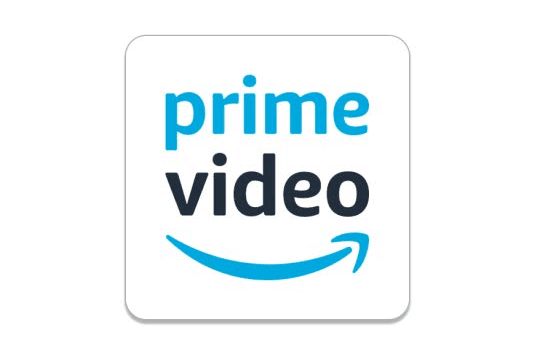 Amazon has a dedicated app to access Prime Video features. 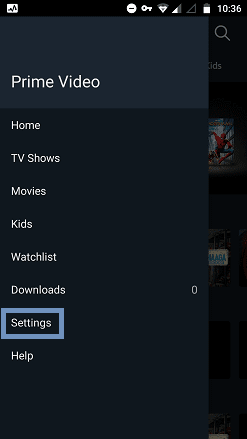 Android and iPhone users can enjoy watching Prime videos. You can also access the prime features on any web browser. If you prefer the mobile app, you might have come across Amazon instant video streaming problems. Few problems like low video quality, low buffering and download speed. Streaming and downloading video use extreme data. If your Internet connection is poor but would like to playback Amazon prime video, you should check out this guide. By changing the video quality settings, you could fix this issue. 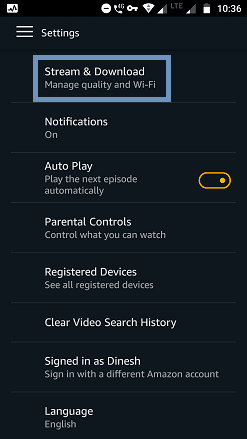 In this tutorial, we'll discuss how to change Amazon Video quality settings on Android and iOS. Launch the Amazon Prime Video app. For iPhone users - tap on Settings. For Android users - tap on 3 horizontal dots (hamburger icon) at the top left side. Now, choose Stream & Download to manage video quality. You'll have two options. One is Streaming Quality and other is Download Quality. Note: To download or stream video over only Wi-Fi, tap on the appropriate toggle switches. Tap on Streaming or Download quality as per your requirement. For both options, you will notice a similarity in settings. Best - 1 hour uses about 0.46 GB of data. 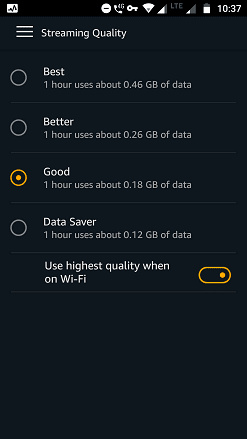 Better - 1 hour uses about 0.26 GB of data. Good - 1 hour uses about 0.18 GB of data. Data Saver - 1 hour uses about 0.12 GB of data. Toggle Switch - Use the highest quality when on Wi-Fi. The default option is Good for Streaming Quality. Under Download Quality, you will see 5 options. The first 4 options are the same as in Streaming Quality. 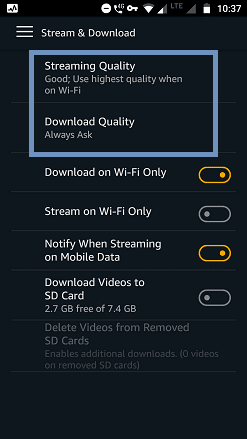 Here, the 5th option is Always Ask to select the quality of each video you'd like to download. It is the default option for Download Quality. Set the preferred video quality depending upon your Internet speed. Poor network connections are the worst case for streaming video. Even after setting up the quality settings as Data Saver, if you're unable to watch streaming video, it is better to download to watch later. Thus, you could save your time instead of waiting for the whole day watching the buffering action. I hope this guide is useful for you. If you liked this tutorial, share it with your friends.